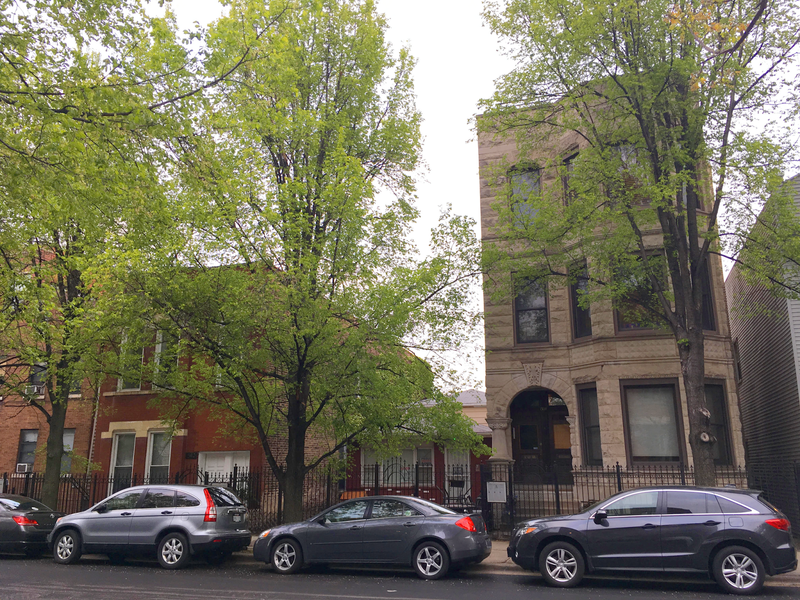 Proposed replacement for a single-family home on Thomas would be higher than either of its neighbors, inviting future teardowns. Bath House Cultural Center, 1019 N. Wolcott Ave.
EVA board was visited by attorney Stephen Barrios, developer Walter/Vladimir Zeleni, property owner Ernesto Rubio and Victor Drapszo of Red Architects. Rubio is seeking to amend a zoning restriction for his property to be redeveloped in the middle of the block on Thomas. Rubio purchased the property in 1998 and currently resides there. The single-family property is between a three-story and a two-story. He is seeking to sell the property to Zeleni for redevelopment and the contract is contingent on a zoning change. Property is currently a RS-3 (residential single-family) seeking to go to RM-5 (residential multifamily) to build a 4-story brick building with 3 concrete parking pads in the rear. Follow Up: The board asked whether the seller/developer might consider RT-4 (two-flat, townhouse, multiunit) zoning vs. RM-5. Follow Up: Please send the list of neighbors that are in support. Recommendation to PP&D, Ald. Brian Hopkins: Consideration for a multiunit building is OK at RT-4. Permitting much larger construction (RM-5) will be an incentive for other buildings in proximity to be torn down. Zoning variance requested, according to notice received by board member Thomas Tomek. Brian Foote will reach out to Ald. Proco Joe Moreno to review details. EVA board letter to Ald. Walter Burnett, Jr. presents questions and concerns about rezoning at 1345 W. Walton St.
EVA treasurer Peter Gariepy resigned, as he has announced his candidacy for Cook County Treasurer. Inter-Group Candidate Forum: Lyn Wolfson at CGNA to coordinate with EVA to deliver the neighborhood association gubernatorial candidate meet & greet. July general membership meeting will be July 10. EVA Block Party/BBQ: date TBA. September general membership meeting to be Sept. 11. In attendance: Michelle Hayward, Daniel Johnson, Neal McKnight, Stephen Rynkiewicz, Thomas Tomek, Michael VanDam.